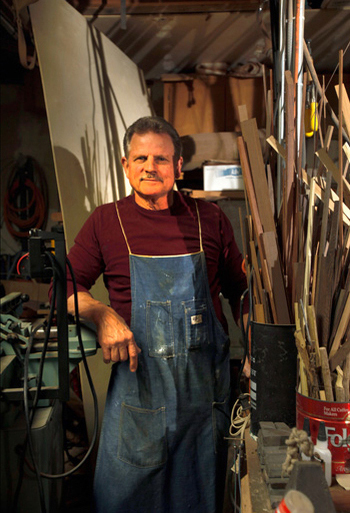 David Blackburn - Master Wood Artist and Craftsman. It’s common knowledge that genius often rears its head in youth. Sometimes it looks more like neurons run amuck than organized thought. Or simply the product of intense parental training, discipline enforced by structure, vis-a-vis the so-called Tiger Mother model. But when you’re talking about David Blackburn, you know you’ve met the real thing. 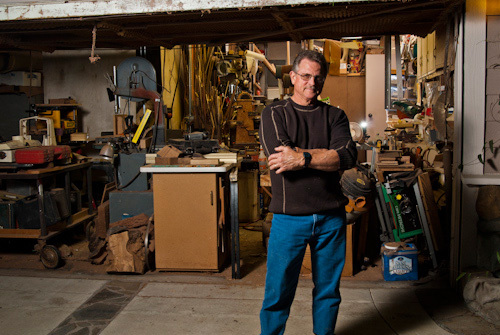 So it comes as no surprise to learn that this Ventura-based, award-winning artist has been obsessed with wood for as long as he can remember. A military brat, Blackburn’s family did the serviceman’s shuffle, moving frequently and living on military bases around the world. From New Orleans to Alaska to Japan, Blackburn spent afternoons and weekends scouting out bits of wood to forge into his latest project, from simple forts to intricate playhouses. Wood, any kind of wood, he tells me, earned a second look: gnarled logs from swamps, forked sticks from the forest, and an occasional piece of lumber scavenged from a public works shed. “Even in Alaska, on a desolate island with no trees, I was a scrounger. I made a two-story fort in third grade,” he chuckles. “Every six months or so the navy would come tear it all down.” To Blackburn, this was another opportunity. A new project to explore. 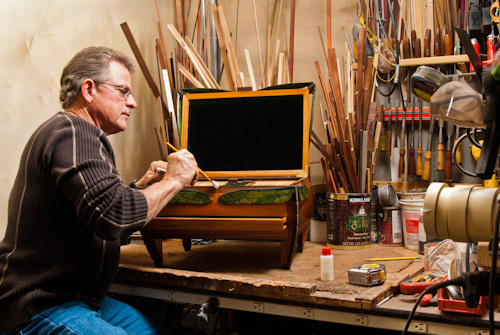 A career and decades later, Blackburn is back on the hunt for the perfect piece of wood—the touch, the grain, the color. Nowadays his searches often take place on the Internet, where he has located exotic quilted maple, manzanita burl, and tiger wood burl. For a recent project, a table entitled “A River Runs Through,” he sourced a highly prized length of quilted maple to create the rippling look of a river and surrounded it with cocobolo, a tropical hardwood from the dalbergia tree, to create the shoreline. The table’s asymmetrical, gnarled legs are from a corkscrew willow tree he cut down outside his kitchen door. For Blackburn, his home has become his showcase. Standing in a corner of his living room, a four-foot-tall heart-shaped jewelry box is the first thing you notice. With 15 drawers, and sitting on a base of Belgian black marble, the massive jewelry box spins on an unseen axle and rod system. Blackburn explains that he used several types of wood and wood burl to create the box, opening each drawer to point out a successive line from First Corinthians 13, “Love Is,” he lasered inside. A hidden compartment is built into a larger hidden compartment. 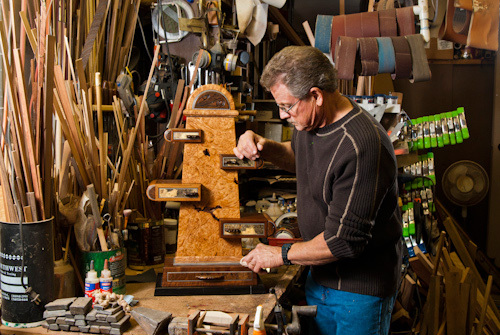 Blackburn’s return to woodworking came after a job layoff 15 years ago, when he saw a cigar humidor. It became his inspiration. 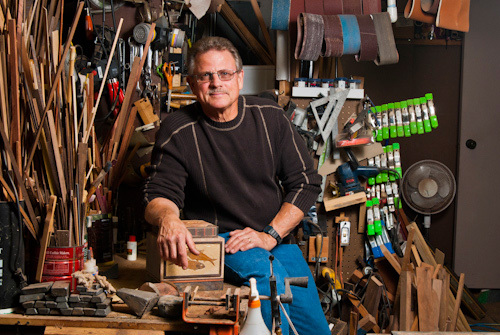 With no formal training other than an Art Appreciation class he took at Ventura College in 1967, he returned to working with wood—as he had as a child. But this time, elaborately crafted boxes replaced forts. These were followed by sculpted bowls, vases, and inlaid boxes. Finally, he moved to furniture and larger items. In a way, Blackburn has come full circle. He’s still on the hunt for the perfectly textured burl, a knot on a tree branch or stump with a unique grain and color, the holy grail of woods. A few years ago, he started adding hidden drawers and spaces. 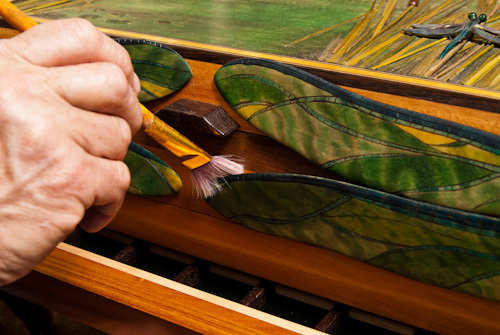 “Now when people pick up one of my pieces, they want to know where the hidden drawer is,” he tells me. As Blackburn reclaims both wood and his past, you can’t help but feel you’ve had a brush with genius.